Published: Jan. 26, 2019 at 03:06 p.m. Updated: Jan. 27, 2019 at 02:50 p.m.
Just one short year ago, the common sentiment around the league was clear: The NFL is in another transition phase. You just had to follow the numbers. In 2017, we saw a decade-low in offensive points per game (21.7), pass rate declined (by 1.7 percent) and yards gained per possession fell year-over-year (by 9 percent). This significant offensive downturn culminated in the wide receiver position having its worst cumulative fantasy year since 2009. While Andrew Luck (16 games), Aaron Rodgers (9 games), and Deshaun Watson (9 games) all missed significant time in 2017, the league also waited longingly for a new-age of quarterbacks to take center stage. We can now take solace that 2017 will be remembered as a random "slump" year plagued by injuries at the quarterback position because the results that followed were well worth the wait. Patrick Mahomes' MVP season has been covered exhaustingly, but more than a few signal-callers had career campaigns this past year. For example, Ben Roethlisberger quietly just threw for the seventh-most passing yards in a single season (5,129) on the fourth-most attempts ever (675). The Steelers pushed the modern envelope this past year, throwing on a league-leading 66 percent of their snaps in neutral situations (game within a score) where league average is 58 percent (per Sharp Football Stats). Speaking of quiet seasons, no one even noticed Matt Ryan averaged 307.8 YPG (third-most in the NFL) and had his second-best year ever in passer rating (108.1). Digging deeper, Ryan was so proficient across the board in 2018 that he ranked third-best in PFF's passer rating when kept clean, when under pressure, and on play-action throws. He was fifth-best throwing deep (20-plus yards) to boot. The touchdown front was just as impressive beyond the bulk numbers. Russell Wilson's 8.2 percent touchdown rate tied Kurt Warner (1999) for 14th-best all-time while Mahomes' 8.6 percent scoring clip is seventh-best ever. Andrew Luck's quick return to form also bolstered the position and he was as sharp as ever in the red-zone, tossing a score on a league-leading 44 percent of his attempts inside of the opponents' 10-yard line. Drew Brees was equally proficient in scoring position, as his 118.1 passer rating in the red-zone lead all quarterbacks. The second place passer in red-zone efficiency may be surprising, though. Not only did Baker Mayfield just set a new rookie record in passing TDs (27), he trailed only Brees in inside-20 passer rating (113.7). Fantasy's WR1 by 0.2 PPR points per game over Antonio Brown, Davante Adams had one of the most consistent seasons ever in 2018. His resume was simply sublime. Adams finished as a top-20 PPR scorer in 14-of-15 games and never scored fewer than 16 points in a single contest. All in, Adams rolled up 80 yards and/or a TD in 15-of-15 games this season while tying 2014 Jordy Nelson for the highest share of Aaron Rodgers' targets in a single-season ever (28 percent). Speaking of consistency, Antonio Brown has been the PPR Gold Standard for each of the last six years, finishing as the WR5, WR2, WR1, WR1, WR1, and WR2 in this span. Brown has posted at least 100 receptions and 1,200 yards in each of these campaigns and is now the only player in NFL history to have five or more seasons with 100-plus receptions and 1,200-plus yards. Moving a little further down the leaderboard reveals Mike Evans' quiet career year. At 25-years-old this past season, Evans set career-highs in YPG (95.3), YPR (17.7), catch rate (62.3 percent). DeAndre Hopkins is only one year older than Evans and just exploded for a career year of his own, posting personal bests in receptions/game (7.3), yards/game (98.3), and catch rate (70.6 percent). His bulk stats are impressive enough, but Deshaun Watson and Hopkins' connection has proven to be a different type of special. This is one of the most absurd stats you will ever see: Per PFF, Hopkins has seen 234 targets from Deshaun Watson over the last two years and has dropped only one pass. One. While stud wideouts led the bounce-back campaign in 2018, there were plenty of avenues to find high-end production this past year. While L.A.'s receiver corps lacks a single elite option, all three players have been an unparalleled model of consistency. Since Sean McVay became the head coach, Rams wideouts are WR14 (Woods), WR17 (Cooks), and WR21 (Kupp) in PPR points per game. Over the last 20 years, only one has quarterback supported three simultaneous top-24 WRs in a single season: Peyton Manning (2004 Colts and 2013 Broncos). Unlike Rams pass catchers, Amari Cooper has been short on consistency his entire career, but the Cowboys' midseason trade unlocked a weekly ceiling out of Cooper we only saw in small glimpses when he in Oakland. In 11 games (including postseason), the former-Raider posted 6 receptions, 81.5 yards, and 0.63 TDs per game -- easily all career-bests. In sum, Cooper averaged 18.0 PPR points per contest as a member of the Cowboys, which would have ranked him one spot behind Odell Beckham (18.3 FPG) for a WR9 fantasy finish. Beyond the elite options, Tyler Boyd (WR20), Kenny Golladay (WR24), and Tyler Lockett (WR25) were all selected well beyond the top rounds in fantasy drafts and were all among the best WR2/3 plays each week. Meanwhile, Will Fuller (WR21 in seven games), Marvin Jones (WR29 in nine games), and DeSean Jackson (WR30 in 12 games) each had their seasons cut short due to injury, but their contributions to fantasy's growing middle class of receivers should not be forgotten, either. If 2018 was just a precursor to the NFL's new golden offensive age, there will continue to be more receiver options than ever to choose from in fantasy. This past year, NFL teams called a pass play 61.7 percent of the time, a new league-record. As a result, league-wide running back carries hit a 12-year low (10,955)in 2018, continuing a precipitous downward trend in rush volume. Fewer carries aren't always a bad thing, though. Especially when considering passing is far more efficient than running. Running backs carved out a 21.5 percent target share in offensive attacks this past season, tying the 2017 season for the 12-year high mark. In 2018, backs recorded new highs in single-season receptions (2,740) and touchdowns (118) -- en route to the best individual fantasy season at the position since 2008. Making broad, negative statements about a proven fantasy football strategy is a surefire way to lose. It's cliche, but true: almost any logical fantasy draft strategy can work if you're a sharp and dutiful weekly manager. However, zero running back drafters assume that because ball carries get injured a significantly higher rate than receivers, it is the wideouts (and a tight end or two) that provide safety in the first few rounds of drafts. However, the probability of the strategy working may be lower now than in year's past. The current issue with Zero RB is two-fold. Over the last two years, 18 of the 24-highest scoring running backs (in PPR points per game) were selected in the first two rounds of fantasy drafts. The oldest back to finish as a fantasy RB1 (top-12) in this span is LeSean McCoy (29 in 2017) while the median age of this top tier is a staggeringly low 24-years-old. These early-round, workhorse backs are accounting for a growing share of the NFL's pass-heavy nature. Receiving backs are simply soaking up targets at a clip we have never seen before. For reference, the running backs selected in the first two rounds of 2018 fantasy drafts accounted for one-quarter of the positions total receptions and this includes Devonta Freeman (who logged 14 carries in 2018) and Jordan Howard (who caught a career-low 20 balls). For reference, 14 running backs were taken in the top two rounds last year. Meanwhile, the wide receiver position has churned out high-ceiling depth for three out of the last four years, perhaps minimizing the advantage of taking receivers often early. Tyreek Hill, Adam Thielen, Stefon Diggs, T.Y. 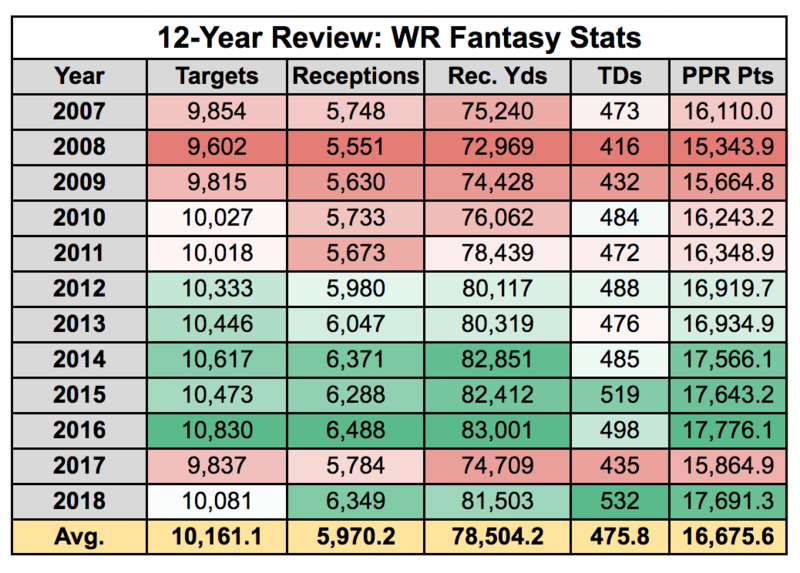 Hilton, JuJu Smith-Schuster, Emmanuel Sanders, Julian Edelman, Cooper Kupp, and Robert Woods were just some of the receiver options RB-heavy drafters were choosing from in rounds 3 through 9 this past year. Moving forward, the prudent strategy in fantasy is not to wholly discard the Zero-RB strategy in drafts, but to adjust it to the changed landscape. Running backs do get injured more often than receivers and tight ends, but the recent shift towards more receiving volume lessens the benefit of taking the injury-prone angle for early-round rushers. The league's rapid increase in passes to running backs has given the position a newfound high floor and ceiling. Meanwhile, the league's ever-growing pass-heavy nature is broadening the receiver pool, naturally giving fantasy managers more weekly starters than ever. Running backs will always suffer injuries more frequently -- and often more severe -- than any other skill position in the NFL. Even though early-round running backs have collectively smashed expectations for two years running, there are obvious examples that highlight Zero-RB can still work if you properly manage the waiver wire and/or nail your mid-round fantasy selections. Nick Chubb needed the Browns to trade Carlos Hyde (among other things), but the rookie rusher was largely available on waiver wires pre-Hyde trade in Week 7. From then on, Chubb posted 16.5 PPR points per game, placing him at RB11 over the full season. Chubb was so dominant on the ground this season that his 4.40 yards after contact was the best clip since PFF began tracking the metric 12 years ago. Phillip Lindsay (RB13; PPR PPG) is another Zero-RB success story off the waiver wire along with 2018 mid-round fantasy selections, Marlon Mack (RB14), Tarik Cohen (RB15), Chris Carson (RB16), and Aaron Jones (RB17). James Conner is another interesting litmus test of the Zero RB theory, but the reason he broke out for an RB7 campaign in 2018 is clear. Let me be very clear here... Zero-RB still can work. Of course, the problem now is that Zero-RB drafters are fighting upstream against workhorse backs paired with the deepest wide receiver group in fantasy football history. The benefits of going Zero-RB are just tempered now because early-round backs are younger and more involved in the passing game than ever and wide receiver is stacked with weekly starters deep into drafts. One position that certainly was not stacked by any stretch was tight end. Right now, tight end is in a simple state of transition. Rob Gronkowski, Greg Olsen, Delanie Walker, Jimmy Graham, and Jordan Reed are aging while potential youth replacements like Hunter Henry, O.J. Howard, and David Njoku have not yet had their breakout campaigns just yet. All told this past year, Travis Kelce, Zach Ertz, George Kittle, and Eric Ebron each ended the year with 11 or more weekly TE1 (top-12) finishes. The next closest tight end in cumulative TE1 weeks was Trey Burton (8). Beyond O.J. Howard and Evan Engram, no other tight end had more than 7 TE1 weeks (top-12) this season. Tight end was so incredibly top heavy in 2018 that Kelce (18.5 FPG), Ertz (17.5 FPG), Kittle (16.0 FPG), and Ebron (14.0 FPG) would have all finished inside of the top-24 scorers among wide receivers. 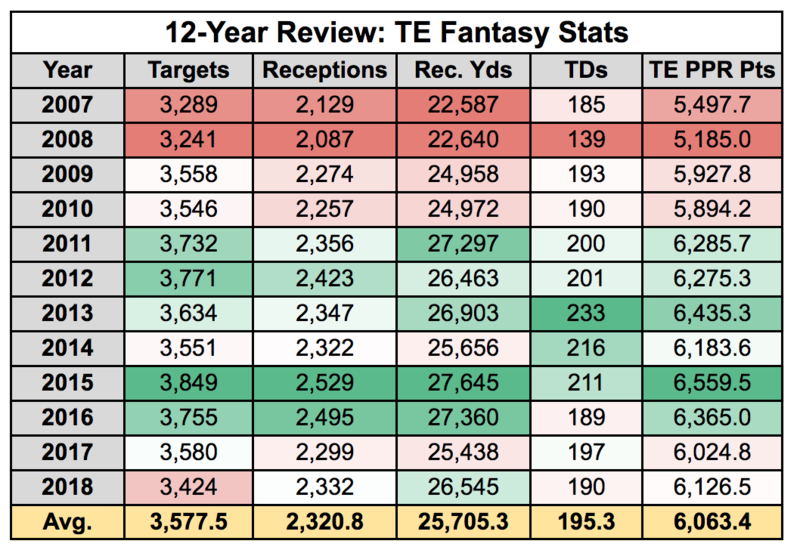 Meanwhile, fantasy's TE5 (Jared Cook), TE6 (OJ Howard), TE7 (Evan Engram), TE8 (Rob Gronkowski), TE9 (Austin Hooper), and TE10 (Kyle Rudolph) each would have finished outside of the top-32 scorers among wide receivers, essentially making them borderline weekly options as far as pass catchers go. To put it more bluntly, the tenth-best tight end (Kyle Rudolph) scored just as many fantasy points per game as the WR61 (DaeSean Hamilton). However, while positional depth crashed and burned in 2018, George Kittle was busy having one of the single most dominant TE seasons in NFL history. Not only did George Kittle just set a new record in single-season receiving yards for a tight end (1,377), he did so by leading the entire NFL in yards after the catch. In fact, Kittle's 9.9 yards after the catch in 2018 is the best figure for any WR or TE since the stat began being tracked in 2006. Kittle's greatness can be defined in many ways, but none were more impressive than what he did on a per route basis. Per PFF's charts, Kittle earned 2.83 yards per route run this season, which trailed only Julio Jones (2.93) for the league lead. Keep in mind, Kittle enjoyed all of this success while playing with three different starting quarterbacks! A former fifth-round pick in the 2017 NFL Draft and a double-digit round selection in fantasy this past year, Kittle is already a living legend and a fantasy football hero. After missing out on the RB1 season by 2.4 PPR points thanks to Saquon Barkley's Week 17 send-off performance, it is safe to say Christian McCaffrey proved his fantasy worth in 2018. The second-year stud caught 107 balls -- the most ever by a running back in a single season -- and never finished with fewer than 13.5 points in a single game this past season (omitting Week 17). McCaffrey's bulk stats are impressive enough, but his year-over-year improvement as a runner is worthy of equal praise. After averaging just 2.1 yards after contact as a rookie (ranking 53rd-of-59 RBs), McCaffrey rumbled for 2.9 YAC/attempt this past season (21st-of-60 RBs). McCaffrey also earned a 55 percent success rate on the ground (fifth-best) after ranking 22nd-of-45 (45 percent) the year prior. McCaffrey's most impressive figures of the year center around his usage, though. Per PFF, McCaffrey missed just 30 offensive snaps total from Weeks 1-16 with Cam Newton on the field. The Panthers' workhorse back played 966 total downs -- 76 more than the next closest back (Ezekiel Elliott: 890) -- which equated to an other-worldly 97.2 percent snap rate. In sum, McCaffrey led all running backs in routes run per game (28.8 in Weeks 1-16), barely edging Saquon Barkley (28.6 routes per game) for the most voluminous receiving back role in football. While Christian McCaffrey "only" tallied 219 carries, he single-handedly redefined what it means to be a workhorse in 2018. This column wouldn't be complete without a breakdown of Tyler Lockett's ridiculous year. By now, you have likely seen that Lockett and Russell Wilson posted a perfect passer rating (158.3) on their connection in 2018. But, a deeper look beyond the surface reveals an absurd level of efficiency that is entirely out of the ordinary. Including the postseason, Tyler Lockett posted 1,085 yards on 76 targets in 2018. For context, Lockett's 14.3 receiving yards per target is the best single-season in YPT since target-tracking began in 1992. The next closest receiver in this span is Jordy Nelson (13.2 YPT in 2011). On a per target basis, Lockett earned the NFL's most efficient receiver season ever... by a full yard! Next Gen Stats released a new metric this season called catch rate probability. Essentially, all the number captures is how difficult a single throw and catch is by a variety of play factors. This year, Tyler Lockett basically broke the system. Per Next Gen, Lockett's catch rate was 19.5 percent above expectation, which easily led the league. Overall, Lockett (80 percent) ranked second behind only Michael Thomas (83 percent) in catch rate. What perhaps makes Lockett's season most impressive is where he earned his production. Per Next Gen Stats, Tyler Lockett and Russell Wilson completed 18-of-23 passes for 663 yards and seven touchdowns on passes that traveled 20 yards in the air. All four figures -- receptions, yards, touchdowns, and catch rate -- easily dusted the league. Over the full season, only 15 receivers had a higher average depth of target downfield than Lockett (13.9 yards). Lockett's 2018 breakout is genuinely one of the league's most uniquely dominant seasons ever. 10. Zeke as 2019's first overall pick? Fantasy footballers won't have to make this decision for many more months, but there is a legitimate case to be made for Ezekiel Elliott as the No. 1 overall pick in 2019. Saquon Barkley will rightly deserve acclaim and Todd Gurley will certainly lead the conversation again even after his injury-filled end to 2018, but Zeke has earned a direct claim to the throne, too. Not only has Elliott led the NFL in rushing yards per game in each of his last three seasons, but he also grew into a massive new receiving role in 2018. After seeing just 77 targets combined across his first 25 career games, Elliott was targeted 95 times last season. For context, that was fifth-most among all running backs behind McCaffrey (124), James White (123), Saquon Barkley (121), and Alvin Kamara (105). Among qualified backs, Elliott ran the fifth-most routes per game (24.7) and was targeted on 26 percent of his routes run which is a far cry from his previous rate over the prior two years (16.5 percent). The only issue that remains is that Elliott's red-zone volume -- attached to the slow-paced Cowboys offense -- pails in comparison to Todd Gurley and the high-flying Rams. Over the last two years, Elliott has averaged 3.8 red-zone opportunities per game (attempts plus targets) compared to Gurley's mammoth 5.1 clip. Still, even though Elliott averaged a career-low 0.56 TDs/game in 2018 after averaging 1.0 scores per day in 2016-17, he posted a career-high 22.1 PPR points per game thanks in large part to his impressive, workhorse role in the pass game. Zeke certainly deserves to be in the debate for first overall.